After more than 70 years, the effects of salt water and air have corroded a number of the structural components of the ship. The immediate task is to replace the rusted floors and frames, and then replace the hull plates where required. As with all Sydney Heritage Fleet restoration projects, we do this work with a team of volunteers. This type of work involves removal of the old sections by oxy cutting the original rivets. The section is removed from the ship with chain blocks and taken to our workshop for replication. The new replacement is then returned to the ship and bolted in place. Final work involves riveting-in the new section. Stage-1, restoring to float the John Oxley, has been planned using a Gantt chart. All tasks and their dependencies are taken into account. This plan ensures that the tasks are done in the correct order and that all are completed before the end of stage-1. A number of floors and frames, or ribs, lower down in the hull have extensive corrosion. Each of the floors that need replacement are removed from the ship and replicated in the on-shore workshop using the same techniques that were employed in building the ship in 1927. Many of the hull plates, in particular at the water and air interface, need replacement. Each plate is removed in turn and used as a template for its dimensions and the drilling of the holes to match its neighbouring plate and frames. It is then shaped, using a hydraulic ram fixture to match the shape of the hull where it will be placed. Once placed back in position it is bolted into place till it is riveted. Steel wedges are placed in the gaps where the plates meet to provide a watertight seal. Our volunteer engineers must overhaul all sea valves, the steam bilge pump followed by the rudder and propeller shafting. 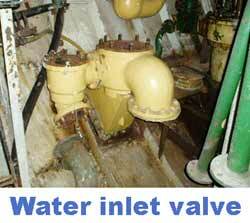 Future work before re-float also includes replacement of the corroded bilge piping system and manifold. Fortunately, most of the valves are in good condition, however all will need extensive de-scaling and overhaul. Some need replacement; our volunteer patternmaker Ken has commenced production of patterns for the casting. Temporary construction wiring and switchboards have been provided to the hold, forward hold, stokehold and engine room for the restoration process. The volunteer electricians are gathering electrical wiring and equipment, rebuilding it and putting into store, ready for the day when they can install it and wire the ship. The ship was fitted with teak decking and internal wood panelling. Much of this is in need of repair and re-finishing. The wheelhouse, in particular, is a fine example of a ship bridge of the period. To gain access to some of the deck plates, a good deal of the timber deck will need to be lifted and replaced.